No one was injured when an airliner was forced to make an emergency landing in a paddock near Dimboola on February 8 1940 after a collision with a bird, whilst on a regular scheduled flight from Melbourne to Perth via Adelaide. At around 8.15 in the morning when the aircraft, a DC-2 named Bungana and operated by Australian National Airways, was flying at a height of 5,500 feet with two pilots, an air hostess and eleven passengers on board when a distinct bump was felt. The co-pilot, First Officer Arthur Lovell, immediately investigated but was unable to find anything wrong, but when the fuel gauge fell to empty and the engine cut out, pilot Captain Norman Croucher decided to divert to the Nhill aerodrome to land and investigate further. About seven or eight minutes after the collision, one engine was observed to be on fire prompting the pilot to begin a spiralling manoeuvre to the left to quickly lose height and push the flames away from the fuel tank. At this point the passengers expected an explosion at any moment, but the hostess, Miss Mavis Matters, remained calm and reassured all those on board whilst carrying out her job preparing for an unplanned landing. When the DC-2 was down to just 100 feet and preparing to land, the damaged engine slipped in its mountings and then fell away altogether. Using the remaining good engine, the pilot was able to control the decent, and although the landing gear crashed through a fence, he was able bring the plane to a safe stop in a paddock about two and a half miles east of Dimboola, skilfully avoiding the one tree in the field. All the passengers and crew remained calm and exited the plane before the men set about putting out the flames with fire extinguishers. Alerted to the impending crash when the stricken plane circled low over the town, the local Fire Brigade was quickly on the scene and prevented the fire from spreading to the stubble in the paddock. Although the aeroplane remained upright after a near normal landing, bags of grain were sourced from the owner of the impromptu landing ground, Mr T.E.Moller, and were stacked under the wings to prevent it from toppling over and suffering any further damage. The detached engine had suffered considerable damage upon impact with the ground where it bounced and rolled a number of times before coming to a stop about half a mile from where the plane came to rest. The aeroplane itself showed a large hole where the engine had been attached and some minor damage to the tailplane. 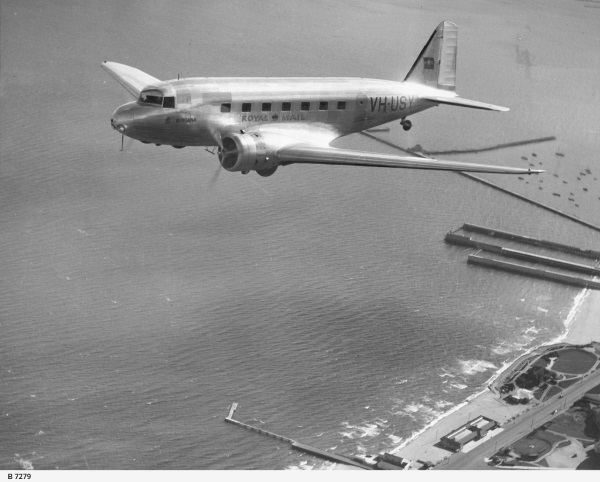 The passengers from the plane were full of praise for the work of the crew in landing safely, and when they were transported into town they sent a telegram to the Australian National Airways company headquarters at Essendon Airport, paying tribute to the crew. "Passengers of Bungana wish to express their appreciation to captain and first officer for their skilful handling of machine, resulting safe landing, and to air hostess, who behaved in splendid manner." After spending the night in Dimboola the passengers travelled to the Nhill aerodrome by bus from where they resumed their journey in another ANA aeroplane, Pengana. Captain Crouch believed that it was an eagle that flew into the plane’s air screw which damaged the engine and severed the fuel line. ANA sent their operation superintendent and engineers to Dimboola in another small plane to investigate the incident, and the two pilots from Bungana flew back to Melbourne later in the day where they collected its sister craft, Pengana, and resumed the journey the next day by flying to Nhill to collect the passengers and then onwards to Western Australia. The wings were removed from the stricken aircraft in preparation for the whole unit being transported back to Melbourne by truck. The damaged engine, which had only been installed in the aeroplane two weeks earlier, was also returned to Melbourne for further investigation.